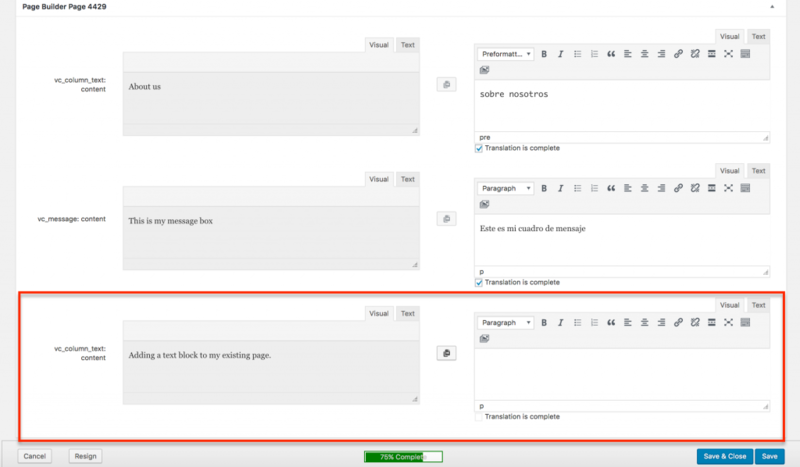 WPML allows you to easily translate pages you build using your favorite page builder. Read this guide to learn which page builders are supported and how to translate page builder designs. We are constantly working on adding more popular page builders to WPML’s list of integrations. If your favorite page builder is not yet integrated with WPML, learn how to easily do this in our guide about integrating page builders that use shortcodes. Use the following steps to translate the contents yourself. The plus located in the Language box when editing my page. 2. You are taken to the WPML’s Translation Editor. Contents in the original language are on the left. Put your translations into the boxes on the right. Please note that you can also style the translations just like with the original WordPress editor. 4. When you are done translating, click Save & Close. To send contents created using page builders to be translated by other translators, you need to go to the WPML -> Translation Management page and use the following steps. 1. Choose the type of your content (page, post, etc. ), select it, and click Add to translation basket. 2. Click the Translation Basket tab, and select the translator for a specific language. Please note that you need to setup the translators beforehand. That’s it! Now, translators will be able to go to the WPML -> Translations page and start with the translation job. They will use the same Translation Editor described in the “Manual Translation” section above. Sometimes, you might have the same text that repeats on your page. WPML automatically recognizes the duplicate contents and offers it for translation as one field. This way, you don’t need to spend time translating the same texts in the page. Naturally, WPML will display the translation of these texts in all the places that they appear on your page. The following image displays a design created using WPBakery Page Builder, using three instances of the very same text. When we translate that page, we can see that the editor only shows one instance of the field to translate this text. Again, this means that we only need to translate it once. Finally, on the front-end, the translation of the text is displayed in all the places as intended. You can always update the translation of pages that were already translated. When the contents of the translated page change, you can simply translate it, or send to translation, once again. This time, you will not need to translate all the contents once again, but only the part that changed, or was added. When updating the default language page content make sure not to update the text and the position of an element inside the page as this will result in losing the translated text. Read more about preserving the existing translations when editing the default language page. Note: Remember to Update the page after adding the module. This is important because it will load the textual elements of the module to the Translation Editor screen. In the Language meta box, you will see an arrow instead of a plus button. This indicates that the translation needs to be updated since you recently added some new content to your default language page. Click on the arrow to update the translation in your secondary language page. You will see the WPML Translation Editor with new fields that need to be filled in. Also, note that the translation completion percentage is back to 75%. Translate and mark the translations as complete, and then Save and Close.